Think of the skeleton as support and a useful tool for reducing muscular tension. 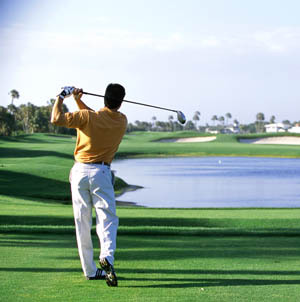 Understand the neurological components to FEAR and the relationship to tension. Use ‘learning’ to improve breathing capacity for lifelong posture. Use a synergistic integrated view of muscular patterns to guide your work. Go to date of Seminar and follow to bottom of page. FEES: Each Seminar varies. Early registration is available. We understand that unplanned issues can come up. We offer full credit for another seminar if you cancel up to 10 days before the Seminar; 50% credit if you need to cancel less than 3 days before. Thanks for your understanding. One receives a Certificate of Completion once one participates in 90 hours of Seminars. Repeating Seminars costs half of full price and counts for half in hours towards Certificate(not CEs). The last two Seminars are required. “Loved Bonnie’s teaching style. It was informative, compassionate, intelligent. !” A very happy student. Regaining a Flexible Spine – protecting the lower back. We prefer you experience an Introductory Seminar before enrolling in others. LEVEL II. One Day seminars (6 CEs) *now offered in one weekend – with an Intro on Friday. FEE: per Seminar. Costs will vary according to when, where and time of registration. Early registration fees are available. “Thank you so much! I have had great success with my 86 year old Parkinson client. I have been using the principles learned and she has been able to relax her adductors. I’m so excited! This is the first morning I’ve woken up pain free and had no tension or stiffness in my body getting out of bed at 5am. Moshe Feldenkrais, D.Sc. created various breathing lessons. He used the action of breathing to bring attention to and shifts to the muscular holding patterns of the rib and diaphragm area. A fully functionally aligned spine/rib area supports breathing while exploring different ways to breath supports alignment. 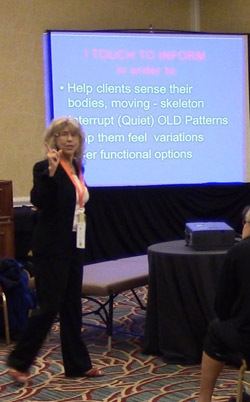 In this seminar, participants will learn ways to engage themselves and their clients with sensory awareness skills that expand the torso for lifelong balanced posture with many useful, practical applications. Our head follows our eyes. Our shoulders are connected to head movement while our spine and skeleton support our head. Using neurological concepts from The Feldenkrais® Method, participants will develop skills that indirectly quiet excessive tension in the muscles of the neck and shoulders so that the head is freer to move – and the shoulders feel more supple. Movement requires an ‘even’ give and take between opposing muscles, the agonists and antagonists. When one set of muscles stays tight, then fluid, easy movement disappears. Efficient functional movement of the spine requires ‘even’ muscular tonus between the flexor and extensor muscles of the torso and an ‘even’ distribution of effort throughout the action. This requires mobilization of the thoracic spine. Support from one’s skeletal system can create more ease in everyday activities. If a person intentionally initiates movement from the pelvis, workload in the low back is reduced and the whole neuromuscular system works with less muscular demands. Participants will be able to perceive clearly muscles that interfere with easy fluid action either by overworking or underworking. They will demonstrate skills that can help their clients fine-tune the neuromuscular relationship between pelvis, spine, and torso for reaching, sitting and standing. The relationship between the eyes and neck and hands and shoulders are a profound example of how one can work indirectly. Using knowledge of how the nervous system develops patterns helps one develop strategies to quiet old patterns in the hands and create new possibilities for the shoulders. Participants will demonstrate an understanding of how the support from the pelvis/skeleton allows the shoulders to rest. They develop a keen awareness to how softening the grip in hands or softening eyes can ease the shoulders and neck. They develop skills that can create shifts in the use of eyes and hands that will ease tension in the neck and shoulders and the neck and shoulders of others. The torso of the human body, the area between the arms and legs, is often considered the ‘engine’ for walking. The large muscles that surround the torso are designed to optimize one’s posture, coordination and balance. However, when one fears falling, these muscles tighten and often remain held in a habitual state of tension. The more this state of fear/tension remains, the less the torso — the engine for our balance and our walking — gets used. Participants discover their walking ‘engine’ through awareness to where the four corners of one’s torso are in space and how they move, or don’t move, to maintain balance and posture. They will develop skills to balance flexors and extensors and broaden their ability to support a client’s ability to regain a strong and flexible organization for walking and other daily activities. Hidden postural habits can affect FEET and ankles. Hidden holdings in FEET and ankles can affect posture. Participants will demonstrate the ability to help their clients sense subtle changes in movements of FEET and how it can improve their ability to move with more comfort and ease overall. They will also fine-tune their ability to change posture to support FEET/legs working more effectively. How familiar are you with the 26 bones, 33 joints, and numerous muscles and nerve endings in each foot? Participants will be able to describe or demonstrate the relationship between posture, balance and movements and what FEET have to do with it. They will demonstrate several options for movement in FEET, toes and ankles, to help not only FEET but also posture. This course is designed to offer LMTs practical clinical strategies from the Feldenkrais Method®, for their clients with low back, spine, hip and knee difficulties in bending, standing and sitting. The focus is on how to make clients more agile. Agility means being able to move easily in any direction. This requires good balance, a brain that senses whole body action, easy joints and an even give and take between flexors and extensors of all muscles working in synergistic patterns. Look and work indirectly to a problem area. Find support and improved balance and thus functional ability. This course is designed to offer LMTs practical strategies from the Feldenkrais Method®, to complement techniques used for those with head, neck, shoulder and jaw joint discomforts. Participants will explore how to use a client’s nervous system to help even and then modulate muscle tone, use the skeleton as support, view muscle tension as part of a habitual pattern for an action and develop skills to interrupt those patterns. Moshe Feldenkrais, D. Sc., a revolutionary thinker about neuro-muscular connections and movement pattern formations. He developed a method that demonstrates that through fine tuned variations to one’s habitual actions, even deeply rooted patterns such as clenching one’s teeth, can be changed. Attention is focused relationally to the jaw joint, with movement explorations of the breath, the eyes, the tongue and voice along with postural support for head, neck and shoulders. Identify physiological response to fear noticing muscle tensions. Identify possible interruptions to jaw tightening including held intercostal muscles and abdominal muscles, as well as increased use of the eyes, throat, and voice. Demonstrate the ability to pause and connect with clients through inquiry and curiosity. Pre-requisite: LMT, healthcare practitioner or educator who has previously integrated 24 hours of TOUCH TO INFORM Seminars. Better Balance Seminars offer gentle self-exploration and partner work to deepen knowledge of the elements required for an efficiently balanced walk and how using these elements can prevent falling. Better Balance I focuses on the three planes of movement; sagittal, frontal and horizontal, and teaches how to disengage habitual patterns clients have developed, in order to support better functional balance. Better Balance II focuses on neurological aspects of finding and maintaining balance. This includes learning how to fall and reverse it. The focus will be a continuation of Better Balance Ialong with applications for different populations; ie young children, athletes as well as those limited with abilities. 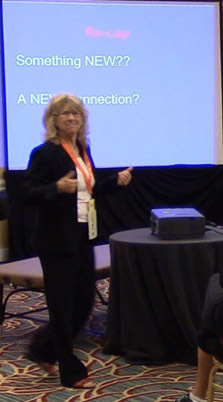 Co-teacher, Co-collaborator of TOUCH TO INFORM Seminars is Nikki Rollason, Feldenkrais Practitioner in Miami, FL. Nikki Rollason lives, dances and practices in Miami, Florida. She received her BFA in dance at the New World School of the Arts and graduated from the Feldenkrais Institute’s Manhattan professional training program (2001). She has performed with the Isadora Duncan Dance Ensemble and Houlihan and Dancers and collaborated on projects with Joanne Barrett, Clifton Childree, Kristin O’Neal, and Naomi Fisher. Created by: Bonnie Kissam, M.A. in Dance/Education, LMT, Feldenkrais Practitioner/Assistant Trainer, Licensed Massage Therapist, FL Lic # 36256.